How do I Choose the Best Discount CPAP? CPAP machines have various features, so it's important to determine exactly what the patient needs before making a purchase. Adorable animal families that will make you "aww"
Can you see through these real-life optical illusions? Choosing the best discount CPAP to treat sleep apnea involves deciding on a supplier to buy from, what type of machine is needed, and what features are required. Discount continuous positive airway pressure (CPAP) machines are available through many medical supply companies. Generic brands are generally cheaper than name brand machines. Large national medical supply companies usually have more discount CPAP machines to choose from and can offer lower prices than locally-owned companies can. Patients with medical insurance should check with their insurance companies before purchasing a CPAP machine to determine what type of machine, if any, their plan will cover. Some hospitals and clinics allow patients to purchase the CPAP machines used during their sleep studies. The cost for these machines is usually higher than purchasing from a medical supply company, however. Some sleep apnea patients only require low-pressure settings to alleviate their symptoms. These patients can usually choose very basic CPAP machines without many extra features. Patients who require higher-pressure settings generally require automatic CPAP machines, which are more expensive. Automatic machines determine the pressure settings needed throughout the night and automatically adjust the pressure to match those needs. Patients who do not have insurance or have an insurance plan that does not cover the cost for their machine can usually find better prices by purchasing a discount CPAP machine through an online retailer. Many large medical supply companies maintain websites where patients can purchase a CPAP machine and have it delivered to their home, provided they have a doctor's prescription. Sites that allow people to purchase CPAP machines without a prescription may not be operating legally, so it is best to avoid these sites when shopping. You should carefully consider the features you need and want when purchasing a CPAP machine. Very basic machines will be the most inexpensive, but they are often large and heavy. Lighter machines are available for patients who travel frequently and need to be able to take their machines with them. Other CPAP machines feature built-in humidifiers and memory chips to record when and for how long you use the machine. This can help provide doctors with data to keep your sleep apnea symptoms manageable. 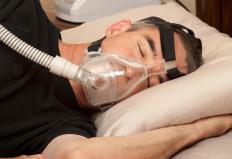 Different types of masks and nasal pillows are available to use with discount CPAP machines. While basic equipment is the cheapest, some patients are not able to use basic masks and nasal devices due to their facial shape or allergies to materials like silicone. A properly-fitting mask is often more important than the machine itself, since a good mask needs to provide air flow into the nose or mouth without breaking the seal and causing leaks. In this way, you can save money by making sure you have a mask or a nasal pillow set that works well for you instead of spending more on a fancy machine. What is the Difference Between a CPAP and a BiPAP? What is a Travel CPAP Machine? What is Positive Airway Pressure? What is a CPAP Mask? How do I Maximize my CPAP Comfort? Make changes/additions/deletions to the article below, and one of our editors will publish your suggestions if warranted. One of our editors will review your suggestion and make changes if warranted. Note that depending on the number of suggestions we receive, this can take anywhere from a few hours to a few days. Thank you for helping to improve wiseGEEK!